Edward IV’s seal re-confirms a grant of privileges originally made by the Earl of Chester in the thirteenth century. This impressive, double-sided great seal in green wax is the authenticating mark of King Edward IV. It was applied to this document on the 3rd July 1463 and has survived more than five hundred and fifty years with only a little damage. The complete seal would originally have been more than twelve centimetres in diameter. 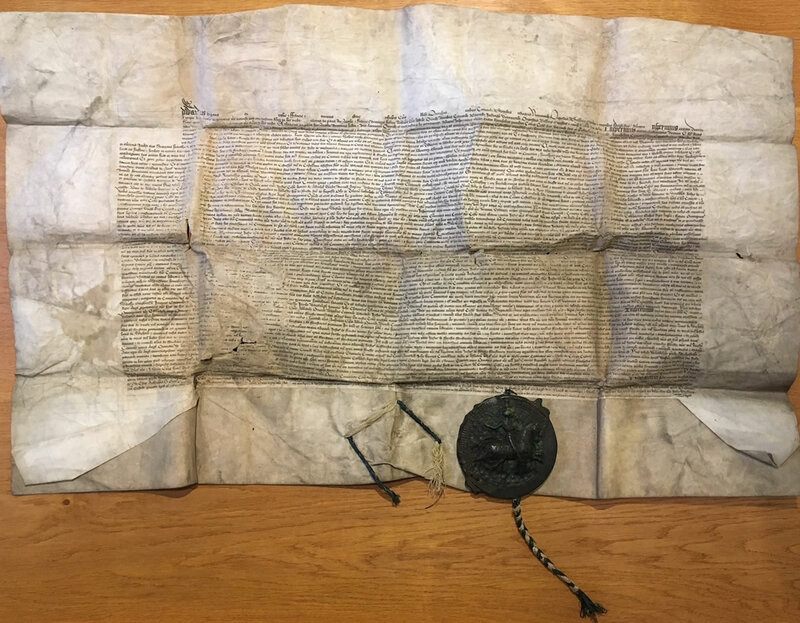 Although the silk strings which attached this seal to the document that it authenticated have broken, separating the seal from the document, the two parts have been kept together. The colour and the age of the silk helps to confirm that they were previously connected. The agreement in question was over privileges which Ranulf had granted to his barons of Chester. A closer reading of the document and some further research suggests that this grant was first made by Ranulf de Blondeville, the 6th Earl of Chester, in 1215 and that it was no ordinary grant. 1215 is an auspicious year in English history, being the year of the first confirmation of Magna Carta, the Great Charter of Liberties, by King John at Runnymede. The king was persuaded to make that grant of privileges and liberties to the barons of his kingdom in attempt to achieve peace. He was a deeply unpopular monarch, politically and militarily unsuccessful. In 1214 his barons rebelled; they resisted his rule and sought legal reform and the promotion of their own rights. During this period, Earl Ranulf of Chester was one of the few barons who remained loyal to King John, along with William Marshall and the earls of Derby and Warwick. Ranulf supported Magna Carta because of its potential to bring peace without costing the king his throne. In 1215 he served as a witness to the confirmation of the great charter. However, in the thirteenth century, the Earldom of Chester was a county palatinate, meaning that Ranulf ruled it with autonomy from the rest of the kingdom. Magna Carta as signed by King John at Runnymede therefore did not apply in Chester. Ranulf’s barons were not entitled to the same privileges that he had advocated and confirmed for all other English barons. Perhaps unsurprisingly, the barons of Chester also wanted their rights to be confirmed and protected. The text of the Magna Carta of Chester records that it was granted “at the petition of the barons of Chester”. Ranulf’s charter has only thirteen clauses, in contrast with the sixty confirmed at Runnymede, but the close similarity of many of them suggests that Ranulf drew heavily on it. King John famously had his first charter of liberties annulled by the Pope within a few months of confirming it. Ranulf showed no such inconsistency, either within his earldom or nationally. He continued to support the Magna Carta, encouraging its reissuing on a number of occasions during his lifetime.